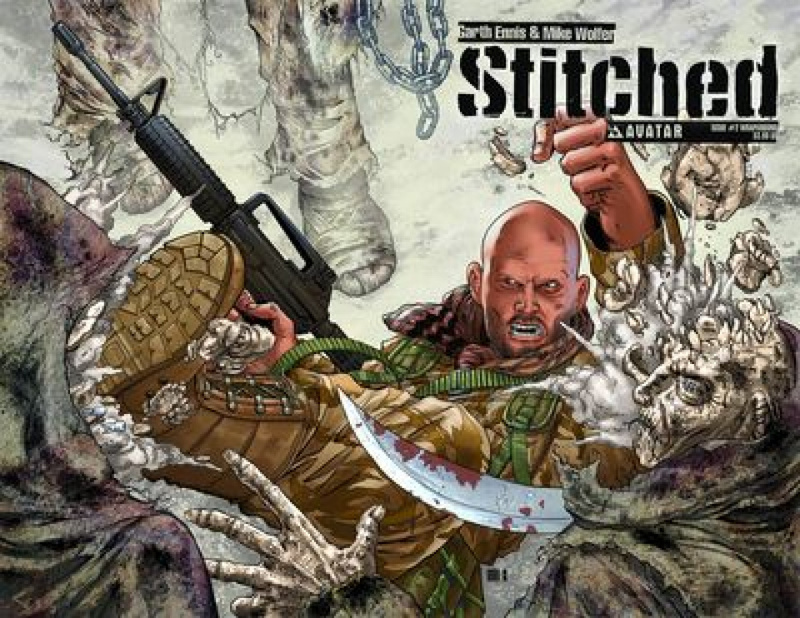 Garth Ennis continues the epic story begun in his film, Stitched! Deep behind enemy lines in war-torn Afghanistan, the surviving crew members of a downed American Blackhawk helicopter faced certain death until the arrival of the three British SAS soldiers who the chopper crew was to extract from unfriendly territory. Death could find them in a dozen different ways, but it's not enemy fire, dehydration or exposure to the elements which the refuge-seeking group fears most- It's the 'Stitches,' the fearsome, corpse-like dead men who hunt the desert wastes, ripping apart both Taliban fighters and coalition forces alike. With precious little water and limited ammo, the six embark on a flight for survival across a desert littered with the corpses of the mutilated and enforced by the supernaturally-animated 'Stitches.' This new on-going series is certain to appeal to Ennis' legions of fans as it pushes the envelope of horror beyond the boundaries of sanity and into fresh nightmares. Stitched #2 is available with a Regular cover, Wraparound cover, and Gore cover by series artist Mike Wolfer, and a special Stitched Movie Photo cover retailer incentive cover.